NEW YORK, April 27, 2016 /PRNewswire/ — Sergio Mannino Studio announces the release of a new collection of graphic floor coverings. Based in Brooklyn, NY, Italian designer Sergio Mannino trained under Alessi designer Remo Buti and Memphis maven Ettore Sottsass. Mannino’s aesthetic fuses an Italian sensibility with a contemporary flair. Ranging from whimsical butterflies to abstract prints inspired by his Italian heritage and playful design point of view, Mannino’s graphic flooring collection is durable yet visually appealing. Durable yet elegant in its design, it’s a perfect choice for high-traffic creative retail spaces, progressive office environments, and forward-thinking homeowners. 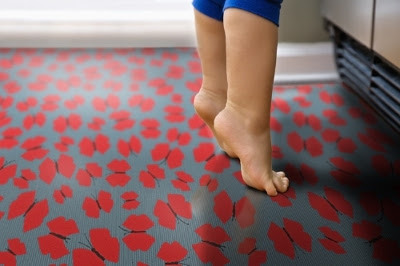 The new Sergio Mannino Studio vinyl floor graphics are available now and range from $12.00 to $18.00 per square foot. The studio’s lead time on the flooring is currently less than three weeks. Those interested can visit http://www.sergiomannino.com/furniture-design-and-objects#vinyl-floor-design for more information. Sergio Mannino Studio is a retail store design firm with roots in Italian design and culture. Based in New York, the studio operates on a global scale, having worked on over 250 stores for companies such as Prada, Miu Miu, Lexus, Vince Camuto, Jessica Simpson, Miss Sixty, Breil, Kensiegirl, Steve Madden, and many others. Through an extensive network of consultants, store design projects can be taken from preliminary brainstorming to built form virtually anywhere. Studio principal Sergio Mannino earned an Architecture degree from the University of Florence and worked extensively in interior design with Ettore Sottsass and Remo Buti. In 2002, he mounted a one-man show of his furniture designs at the Memphis Gallery in Milan. In 2008, Mannino’s “ooo! Lamp” was featured at the furniture fair in New York and nominated best pick of the ICFF by Metropolis magazine. Most recently, the Studio introduced the colorful and modular “Non-Flying Carpet” and the “Inside-Out” series at the New York show “Wanted Design” during the NYCxDesign week. The Studio’s work has been published in magazines, books and blogs around the world, including most recently, Wallpaper.com, for a series of lamps inspired by the artist John McCracken.